Blended learning is a hot topic in the eLearning industry, but how much do you really know about this interactive and engaging learning strategy? When did blended learning make its debut, and how did it evolve into what it is today? Let's explore the history of blended learning. In order to create a successful blended learning strategy, it's wise to learn as much as possible about its key ideas and values. To understand these, however, you must first know how it all got started and the historical highlights that shaped its core principles along the way. 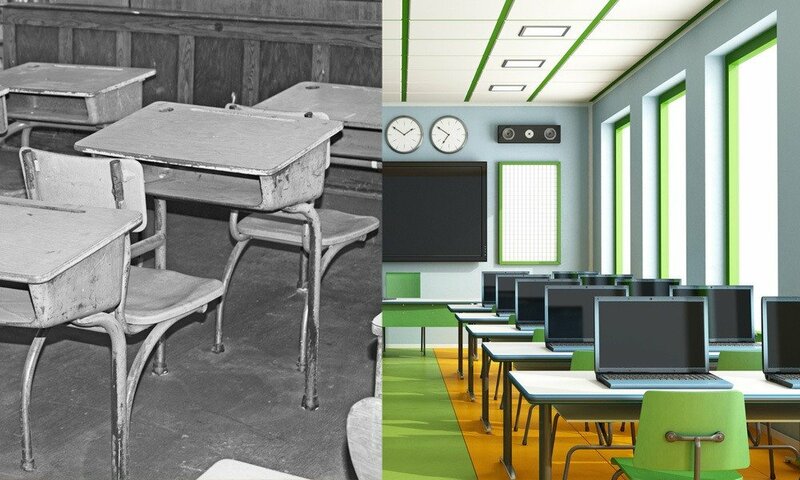 So, let's hop into the miniature time machines in our minds and travel back to the beginning of blended learning. Sir Isaac Pitman launches the first distance education course. Though there were other variations on the concept prior to Pitman’s, his was to resemble distance learning as we know it today. His course centered on shorthand. Pitman sent shorthand texts to his students via mailed postcards and they were required to send them back to be graded and corrected. Even though computers and mobile devices weren’t involved, and wouldn’t even be invented for roughly a century, effective feedback and assessments were still an integral part of the process. Modern computer-based training can be traced back to the mini-computer and mainframe training of the 60’s and 70’s. It was the first time that training could be deployed to countless workers within an organization without having to rely on printed materials and face-to-face instruction. Employees could simply login to their character-based terminals to access the information. One of the most notable systems was Plato, which was developed by Control Data and the University of Illinois back in 1963. In fact, Plato is still around today. At this stage in the blended learning timeline, companies began using video networks to train their employees. The instructor no longer had to be physically on-site in order to onboard new hires or broaden the skill sets of existing staff members. This made the training experience more interactive and engaging. Learners were able to communicate with their peers, watch the instructor on TV, and even address any questions or concerns sending them by mail. Think of it as the predecessor to webinars and video conferencing. One of the most successful satellite-based training case studies is the Stanford University Interactive TV network. Stanford devoted resources to their video network in the 70’s and 80’s so that professors could hold classes in multiple locations throughout SF at once, and it is still running to this day. Instead of having to send assignments to the professor by mail or courier, learners can now submit their work for review online. As technology evolved, so did blended training strategies and applications. Schools and organizations began using CD-ROMs to deliver more interactive learning experiences, such as those that feature video and sound. This delivery format could hold larger quantities of information, which made them ideally suited for distance learning. For the first time in eLearning history, computer-based courses were now able to offer a rich and comprehensive learning experience. In some cases, it even took the place of face-to-face instruction. This is also when the first Learning Management Systems (LMS) were introduced, though they didn’t offer the same functionality as the solutions available today. Organizations wanted to be able to track learner progress and improve online training courses, and these systems helped to monitor eLearning course completion, enrollment data, and user performance within the CD-ROM network. Blended learning, and eLearning as a whole, has seen rapid change in the past two decades, beginning in 1998 with the first generation of web-based instruction. Computers were no longer just for organizations and the wealthy few, but for the masses. More and more households began purchasing personal computers for their families to enjoy, while companies made PCs readily available for every employee. Then computers started to offer greater interactivity. Graphics, sound, and video became more immersive, while browsers increased connection speeds and gave virtually everyone access to internet learning resources. Rather than having to distribute CD-ROMs to learners, organizations could simply upload material, eLearning assessments, and assignments via the web, and learners could access them with a click of a mouse button. At first, many CD-ROM developers tried to simply publish their eLearning courses to the internet without making any modifications. However, they quickly learned that their existing online content, such as large video files that took minutes to download, would need to be finely tuned to meet the needs of web-based learners. We currently find ourselves in an exciting time for blended learning. Technology is rapidly changing and an increasing number of organizations and private learning institutions are beginning to see the benefits of a blended learning approach. From interactive scenarios in the classroom to webinars and online tutorials, learners now have a wide range of tech tools and applications at their disposal. Companies have the opportunity to train their employees anywhere at any time, while online learners can participate in online communities and interactive eLearning courses from anywhere in the world. Gradually, the union between face-to-face instruction and technology-based learning is producing new and creative ways to enrich the educational experience and make learning fun, exciting, and even more beneficial. Blended learning has a proven track record of bringing traditional classrooms into the tech-friendly 21st century. Now that you know the history of blended learning, why not use it to transform your curriculum into an interactive and engaging learning experience. Searching for ways to start integrating blended learning into your learning strategy? Read the article 7 tips to implement blended learning in corporate training to learn how to implement blended learning in corporate training.